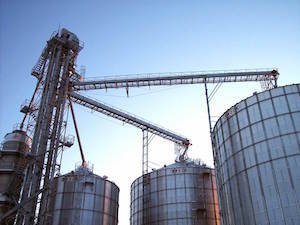 Check out the latest grain handling and storage products from some of the industry's leading suppliers. REM’s research and design team designed the GrainVac VRX to perform under pressure, while maintaining a sound volume quieter than a tractor. The signature shape of the VRX was designed with speed in mind, while minimizing impact and maximizing the auger feed. Improvements on key components such as the fan and throttle ensure longevity. 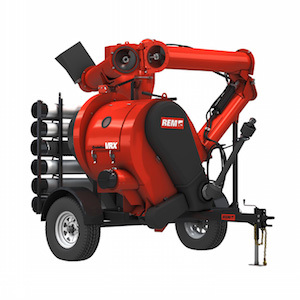 When it comes to efficiency, speed and durability, REM’s GrainVac VRX sets the standard. Westfield's MKX 130 features over 75 proven performance enhancements, specializing in ease-of-use and serviceability. For added convenience, the MKX 130 is available with the GULP2 Drive Over Hopper. The GULP2 transports with your MKX 130 auger, no disassembly required, and is designed to match the auger capacity. The hydraulically controlled power swing raises, lowers and drives the GULP2, providing precise placement at your fingertips with little effort, saving you time. The low profile hopper sits at 4.5 in. high and features a large catchment area and durable chevron belt. The GULP2 is now available on the MKX 160. Introducing Brandt’s new 10-, 13- and 16-in. Swing Away Augers with ultra high-capacity and durability. These high-capacity augers are built on the most reliable platform in the industry and give you the ability to move more grain than ever before. Available in 60- to 110-ft. lengths, the new XL and HP models have been carefully engineered to deliver maximum efficiency and move up to 13,000 bu./hr. For farmers who demand even more, the Brandt 16 in. HP offers the ultimate in performance with lengths up to 125 ft. and an impressive capacity of 23,000 bu./hr. Brandt swing away augers also offer benefits such as low-profile, self-leveling hoppers, hydraulic/electric movers and extended life flighting; allowing you to tailor your swing away auger to perfectly suit your operation and giving you top performance and durability at harvest. Nothing will get your trucks loaded and rolling, like a reliable, high-performance Field GrainBelt from Brandt. Available in 35- to 47-ft. lengths, Brandt GrainBelts combine outstanding performance with legendary dependability to dramatically reduce bin unload times while protecting your grain quality. Brandt’s new 15LP+ Field GrainBelts offer the industry’s fastest 15-in. belt, delivering up to 9,000 bu./hr. along with a reduced-friction intake design, larger rollers and bearings, EZTRAK tension system, plus increased reach and fuel capacity. For the ultimate in performance and efficiency, Brandt’s 2045LP GrainBelt delivers an outstanding 14,000 bu./hr. at truck loading height. Now you can have it both ways; the gentle handling characteristics of a premium conveyor and the capacity to move grain more quickly than ever before. 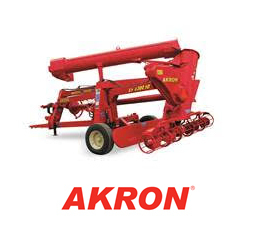 The AKRON GTX3230 Grain Bag Loader has been designed to work under the most demanding conditions. Its 20-in. 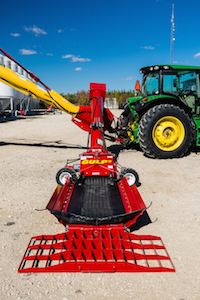 auger features a great loading performance that will save you time during harvest and is made to easily accept a trunk unloading system. With the large 8 1/2-by-11-ft. loading hopper, it is easy to line the grain cart up with the bagger and requires very little movement of the grain carts when loading. The GTX3230 has two outstanding features that ensure a very easy bag load: the Hydraulic Extendable Pan™ and the Easy Lift™ cradle. These are two GTX3230 standard features that will make the bag loading process simple and fast, even with larger bags. It’s 5 working lights come as standard equipment assuring a greater visibility during night work. Click here for more information or call Busch Equipment Company at 402-563-1502. 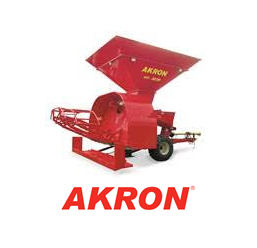 The AKRON EXG300 Grain Bag Unloader has set new standards in the grain bag industry with the innovative features that will help you unload grain bags easily. After being proven and tested in the most demanding markets and rough conditions, the EXG300 has shown to stand out from competitors. It features a large 17-in. 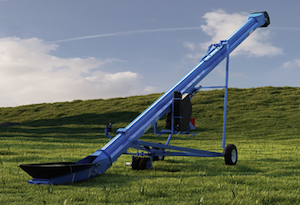 vertical auger and is capable of quickly loading semis to keep your operation efficient. It is also the only unloader on the market to come with a grain pusher as standard equipment. This feature allows additional efficiency while loading the semi and also makes cleanup very easy. 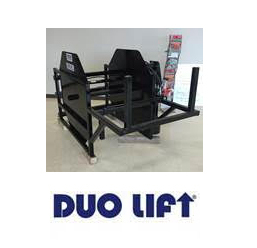 Duo Lift Manufacturing introduces a brand-new product. The all-new HBR2550 Grain Bag Roller. This roller allows you to clean up used bags with ease. A front end loader or skid steer mount options are available. It has an easy 2-level operator control station keeps the operator out of harm’s way and only needs 1 hydraulic port on the power unit. 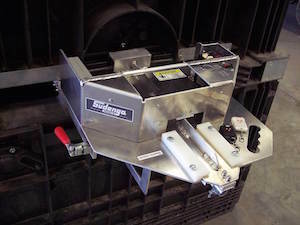 The bag chamber holds up to a 10 by 300 grain bag and allows for easy startup and discharge of the bag. The HBR2550 standard color is black and comes with a standard 1-year factory warranty. The best Gravity Grain Spreader on the market is the AgriDry Grain Spreader because of the customer service team at AgriDry. Spread the fines throughout the entire grain mass and eliminate the need to core, clean or blend the grain before you sell to market. Also creating a better environment to manage temperatures throughout storage. Spreader models available to handle fill rates ranging from 100 bph to 40,000 bph. Customized to fit your application. Experienced customer service team to ensure your spreader works for you! Make emptying seed boxes and filling seed tenders and planters a one-man job with the BOS II from Sudenga Industries. The commercial grade, patent pending, wireless seed box opening system allows you to work safer by staying on the ground. The BOS II weighs 26 lb. and is easy to install. Simply attach the BOS II to the seed box and use the hand-held remote controls to operate the device from up to fifty feet away. It works with almost 50 lb. of linear force so it’s able to open and close easily under the force of flowing seed. Sudenga Industries is proud to be an industry leader in the design and manufacture of innovative handling systems for bulk material applications. Our bucket elevators and chain conveyors are designed and built to exacting specifications, giving the owner a system that will provide more years of service, with less downtime and repair. They are available in industrial or agricultural formats with capacities as high as 40,000 bph and in runs up to 200 ft. We offer many options and accessories that allow each system to be tailored for you. The only system you’ll ever need. 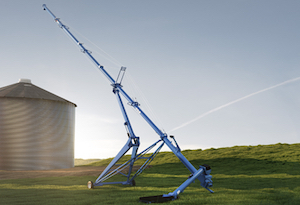 Gives one person total grain-handling capability! Do it all with the Walinga Agri-Vac. Fill or empty any storage facility being used. 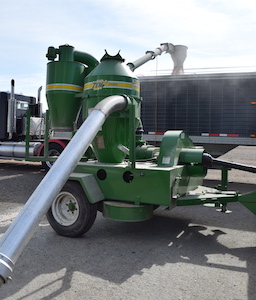 The Walinga Agri-Vac puts an end to legs, augers, sweeps and shovels. 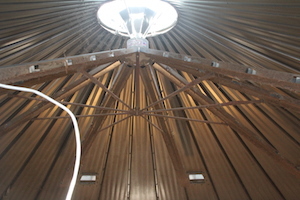 Grain handling has never been simpler, safer or healthier. Just couple the Agri-Vac to your tractor and drive into position. Lightweight vacuum/pressure hoses attach in seconds and ex easily. Suddenly even tight spots and awkward angles are no problem! Meridian’s Smooth Wall Grain Bins from Hamilton Systems, Inc.
Meridian’s Smooth Wall Grain Bins are the most versatile, multi-purpose hopper bins on the market today and come in a large variety of models to suit your needs. We offer Meridian’s Multi-Purpose Storage, GrainMax Series, SeedMax Series and many more! Top quality grain and seed storage. Now due to the low Canadian dollar, by Hamilton Systems, Inc. can also help provide the very best prices available. Click here for more information, call us at 701-454-3875 or email help@hamiltonsystemsinc.com.